We’re taking a peek inside the classroom to offer students a sampling of what they might experience. This week we visited a Culinary Arts lab to see learning in progress. 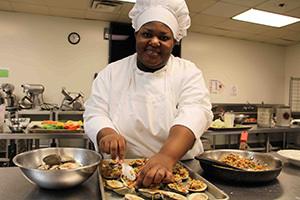 Fresh ingredients and dishes from across the United States are featured in this American Regional Cuisine (HRI 207) lab. 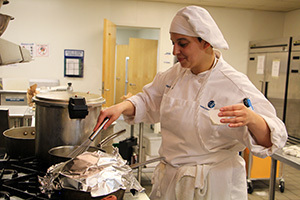 Student chefs prepare three-course meals in a timed restaurant-style setting. Once the dishes are ready, they are presented to Chef Deanna Freridge, culinary arts faculty, and students for taste testing and grading. 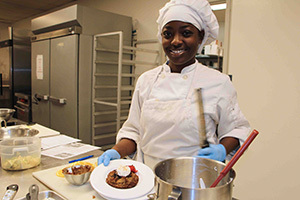 This week, students explored New England fare and prepared dishes including crab cakes, butternut squash soup, Rhode Island Johnny Cakes, New England clam chowder, apple crisp and Indian pudding. What’s fabulous about this class? Cooking with speed and purpose is key. Be ready to work on a timeline and use proper techniques. Freridge is a professional chef who has been creating culinary delights since 1985. She is also the former owner of two catering companies. She has been teaching at the college for a decade.